Barbara and Rene Stoeltie bring you yet another excursion to the best of the worlds country homes-this time to the mythical land of Greece. Go island hopping with the Stoelties and discover the best of Greece&apos;s hidden treats, such as the hilltop vacation house of Robert Browning, descendent of the English poet, in Hydra, a stunning 18th century Turkish-Greek palace-the former residence of a Turkish governor, now inhabited by a farmer and his family-on the Argo-Saronic Islands, and the cozy, romantic home of Onassiss ex-pilot Basile Touloumtzoglou and his wife, Tilly. 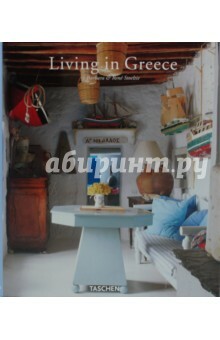 The magic of Greece&apos;s old-world charm drips from the pages of this book, which features 22 homes throughout the country. About the editor: Angelika Taschen studied art history and German literature in Heidelberg, gaining her doctorate in 1986. Working for TASCHEN since 1987, she has published numerous titles on art, architecture, photography, design, travel, and lifestyle. About the author: Barbara and Rene Stoeltie both began their careers as artists and gallery owners. With Rene as photographer and Barbara as writer, they have been collaborating on interior design articles since 1984, contributing to such in?uential magazines as Vogue, The World of Interiors, AD, Elle, House and Garden, Country Living and House Beautiful. Издание на английском, французском и немецком языках.